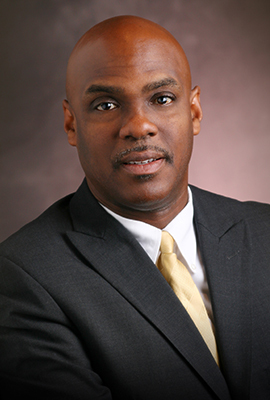 Gregory L. Roseboro is Georgia Law's executive director of admissions. In this position, Roseboro oversees the law school's admissions process for the Juris Doctor and graduate programs. Roseboro is also involved in student affairs, academic support, alumni relations and community outreach as he continues to direct diversity programs at Georgia Law, a role he assumed in 2008. Additionally, he serves as the adviser to the Davenport-Benham Black Law Students Association, the Asian Law Students Association, the Hispanic Law Students Association and the Outlaws student organization. Roseboro initially joined the law school's staff in 1994 as assistant director of admissions, student affairs and legal career services, and he was promoted to associate director 2000. He previously served for five years as a settlement negotiator with State Farm and the United Services Automobile Association before going into private law practice in Athens. Roseboro earned both his bachelor's degree in criminal justice and his law degree from UGA. While an undergraduate at Georgia, he excelled as a mid-distance runner. He was selected as team co-captain and was named to the All-SEC and U.S. Junior Team for the 800 meters. A strong believer in giving back to the community, Roseboro plays an active leadership role in civic affairs and is the former pastor of the Piney Grove Baptist Church in Comer.